Checksforless.com offers a variety of business deposit ticket formats designed to meet your large or small business needs. Rest assured you’ll receive the highest-quality, bank approved deposit slips. 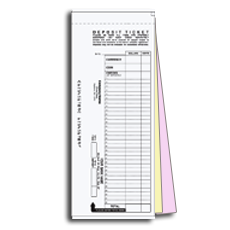 We have a large selection of deposit slips from personal to business; from software tickets to 7-ring binder styles. 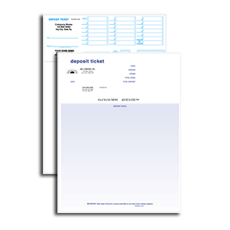 Quickly and easily deposit and cash checks with one of our 10 styles of deposit slips. Quickly and easily deposit checks, cash, currency and/or food stamps depending on the deposit ticket style you select. 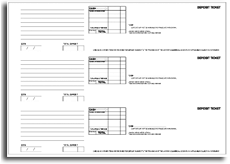 Your company information and bank account information are pre-printed on the deposit slips to save you time. Available in 10 different formats. Note: For duplicate, triplicate, and 4-part: The original is followed by a separate yellow, non-negotiable copy for the duplicate; then a separate pink, non-negotiable copy for the triplicate; then a separate goldenrod, non-negotiable copy for the 4th part. Save time and reduce errors using Qulckbooks® or Peachtree® laser deposit tickets. Use the data you've already entered to ensure accuracy and eliminate the need for double entry. Your imprint and bank account information is pre-printed on the deposit slips. Available in 2 formats. Note: For duplicate, & triplicate. The original is followed by a separate yellow, non-negotiable copy for the duplicate; then a separate pink, non-negotiable copy for the triplicate. Quickly and easily deposit cash, currency and checks with our personal deposit tickets. 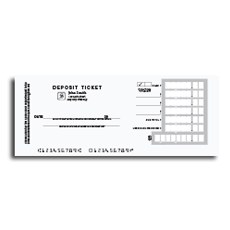 Compactly sized, personal deposit slips work well when there is a limited number of items per deposit ticket. Our 3-per-page Manual Deposit Tickets fit in the 7-ring binder for easy access. These slips are preprinted with your account number, name, and address to save you time at the bank. Super fast In-plant Production within 24 to 72 hours. We Guarantee It!